I am getting all excited just looking through the photos to create this post! This is my recap of the Disney Princess Half Marathon Weekend. We arrived in Orlando on Thursday, and we made our way over to the Expo after checking in to our hotel. The weekend had a bit of a rough start, because we had planned to travel to the hotel via the Magical Express, however, when we went downstairs to get on a bus, the sheer amount of people waiting to make that trip the same way was insane. My husband gauged my mood correctly, and made the suggestion that we take a taxi. It was not cheap, but then again, nothing really is cheap when you are doing a Disney vacation. The cost was worth me not getting in a very bad mood waiting for an hour or more to ride a bus to the hotel. At the Expo, I did not have a negative experience, the way many of the bloggers who have posted about this Expo have. I didn’t get there until Thursday afternoon, and therefore was not there for the crush of people at the opening, so it was relatively painless. I will say, however, there was some merchandise that appears to have been sold out by the time I arrived. Honestly, I love “stuff” but if it meant getting in the brawl, I will do without. As seen above, I was able to have a quick meeting with Cinderella’s footmen, they were so regal. Later that afternoon, we visited Animal Kingdom briefly, before heading to our reservation at Chef Mickey’s. It was awesome dining with Mickey and friends, and as you can see, I had gotten my nails done in a Minnie Mouse theme, and she was very, very impressed. Minnie is my favorite of the original Mickey Mouse characters, so I was extremely excited. Friday brought about a trip to Epcot, which I had never previously been to. It was awesome! I did not see everything by any means, but I did not feel any huge need to do so, as we have annual passes and are going back for multiple races. Friday night, I set out my outfit, and it was time to try to get some sleep in preparation for the Enchanted 10K. I did not plan a costume, I decided to just make sure I was comfortable. I had a pink theme going on which I feel absolutely works with a princess weekend, and I was good with that. The next morning came early, and we were on a bus to the starting area by around 3:30am. I have heard various things about the way Disney handles race transportation, so I was a little bit concerned, however, it really did go quite smoothly. We walked down to the front desk area and got right on a bus. The walk from the buses to the starting area was a good way to keep warm, and they had lots of music and it was exciting. There were several areas where you could stand in line to get your picture taken, I think some of those lines had characters at them, however, I was simply too nervous to do so. As soon as they allowed us to go to our corrals, I headed to my corral. I had heard the horror stories of the dreaded walk to the corrals, and so I was anxious. Come to find out, the dreaded walk is only for the half marathon, so I worried (and stood alone for 30 minutes instead of with my husband) for no good reason. I was in corral E, but there were tons of people in the corrals, and there was probably 10-15 minutes between corrals, so the elite runners were probably getting ready to finish before I even started. The race itself was unremarkable for the first three miles or so. I got to see Anna and Elsa on the overpass, and that was kind of cool, and there were character stops, but the lines were too long and I was too worried about not being fast enough, so I didn’t stop. I mostly tried to relax and take in the moment. The first three miles that was difficult because there were sooooo many people! Nobody respected the etiquette rules, I was passed on the left and right (even though I was very much to the right, as walkers are supposed to be) and more than once someone nearly tripped me up. The people in front of me that I ended up passing didn’t respect etiquette either, often moving in big groups, or walking 3-4 abreast, making it hard to move around them. Despite all this, I really just wanted to have fun, not be annoyed, so I tried to relax. Around mile 2, I passed a sweeper bus, just sitting there, but there were actually a lot of people on it, who I guess, for whatever reason, were quitting. It was not a point of actually being swept when I passed it, but it was clearly poised for action. It made me a little nervous just seeing it, however, there were hundreds of people behind me so I just kept on moving. Once we entered Epcot, I was so excited! The race changed dramatically for me, and I was super pumped! Even the backstage areas were infusing me with that Disney magic, and I was happy. The last 3 miles of the 6.2 mile race were amazing. I LOVED it and cannot say enough about it! 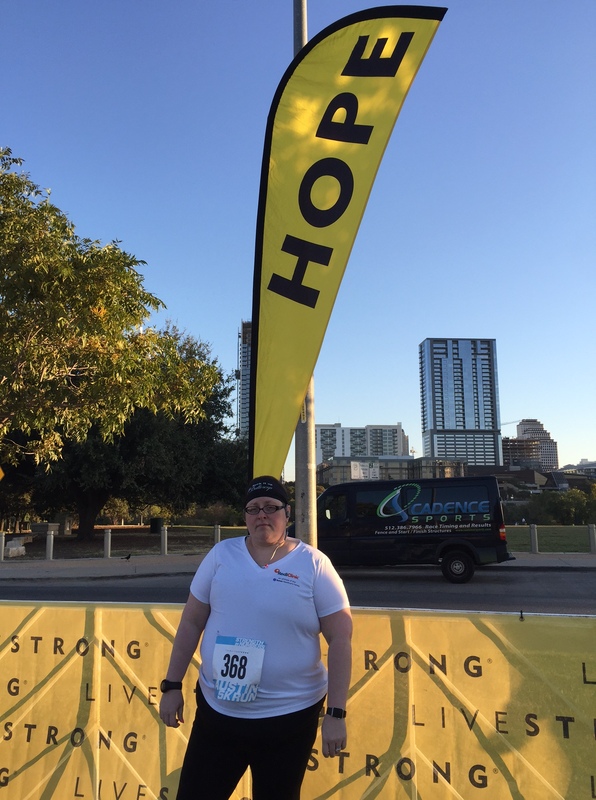 When I finished, I felt so good, and I was totally excited about running the next day! I collected my medal, met up with my very encouraging husband, and we were off to enjoy the parks, starting with breakfast with the Princesses. We enjoyed ourselves, I was so happy, and we headed to bed relatively early. This is where I will mention the hotel stay. We had chosen to try to be economical, and we chose to stay at the Disney All Star Movies Resort. I was not happy. We were in a room quite far from the front desk, our room, while clean, really was in need of updating. The fan in our bathroom would stick in the ON position after the housekeeper put it on, every single day, after we turned it off, afraid of breaking the timer switch every day. The air conditioning locks out at 68 degrees. This might not seem like a big deal to the average person, however, when I am staying at a hotel, I really like to be able to bundle up and like the temperature to be around 66. Those two degrees coupled with the humidity of Florida were really annoying. I just didn’t feel the Disney Magic at the All Star Resorts. I have stayed at them before with no complaints, so perhaps my standards have just changed over the years, but before we even left Orlando, I changed our reservation for the April trip, and we will be staying at Disney’s Saratoga Springs Resort & Spa in a one bedroom villa. I was sold when I saw the whirlpool soaking tub, and we got a decent rate based upon the passholder discount. My husband agreed, and we will be staying at the nicer resorts for all future visits. Anyway, so heading into the half marathon morning, I really didn’t get the greatest night’s sleep because the bed really was not comfortable, but I still arose in good spirits, ready for the day’s excitement! 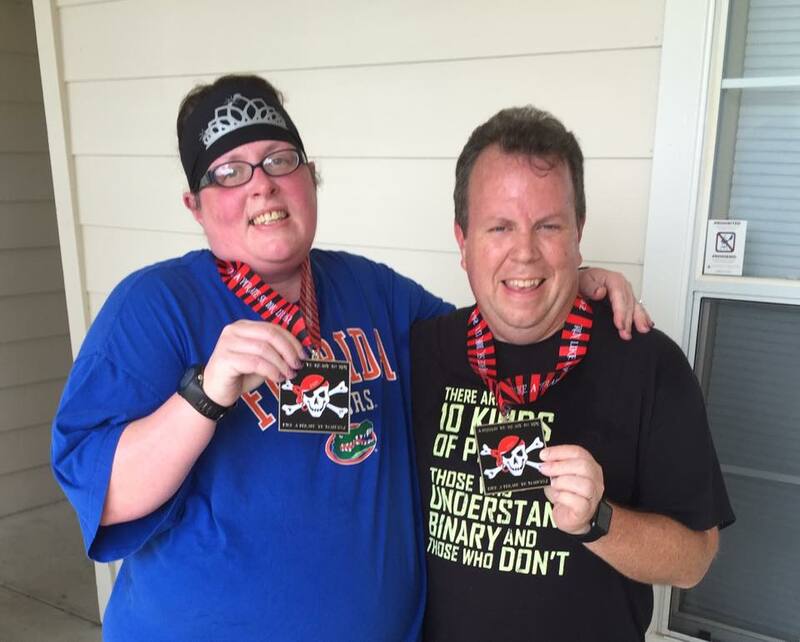 After all, we had sprung for the Race Retreat for both myself and my husband, and I was about to get to run a race through Cinderella’s Castle and run down Main Street! What!?! I had been looking forward to and planning for this for months and months. Then I took a step out of the bed. Heh. I had a nasty pain on the outside of my foot, between my ankle and my heel. I tried to stay positive, I got dressed, and I thought, I will just stretch it out and walk it off. As we were walking towards the bus to head to the starting area, the pain intensified, to the point I was unable to walk without a limp. I was starting to get worried, but I still was hoping I could walk and stretch it off. I will not continue to belabor the point, but ultimately, I decided not to participate. I was unable to walk without a limp no matter how hard I tried, and I knew that would mean there was no way I could keep up with the 16 minute mile pace, and getting swept would have been heartbreaking to me. I don’t want to take anything away from individuals who do not complete the course and still decide to take the medal being swept, that is their choice, but for me, if I don’t earn the medal, I don’t want it. I tried not to let it get me too down, I was very disappointed, and my foot hurt, but we did finish out our vacation with some time in the parks. I didn’t walk much, Sometimes I just sat and let my Disney nerd husband go off on his own, and twice I returned to the hotel and rested while he stayed and did some things he found enjoyable, and I was very happy for him to be able to do that. I just kept reminding myself I have more races coming, and not doing the race and risking serious injury for trying was the smart thing to do. Overall, this was an amazing first runDisney experience, even with the disappointment of not getting to do the Half Marathon and complete the Glass Slipper Challenge. I am super excited to return in April for the Dark Side Challenge, and I am keeping positive thoughts that I will be able to complete the challenge. I am more prepared, we have made rookie mistakes (hello Magical Express, Disney All Star Resorts) and I fully expect our next runDisney adventure will be even more magical, and full of pixie dust! So, it has been way too, too long since I have updated this blog. I am very proud to say that even though I have hit some detours, and not made the progress I wanted to make, I am still going strong, maybe even stronger in the long run. That being said, here is my recap of the Rock n’ Roll San Antonio weekend. 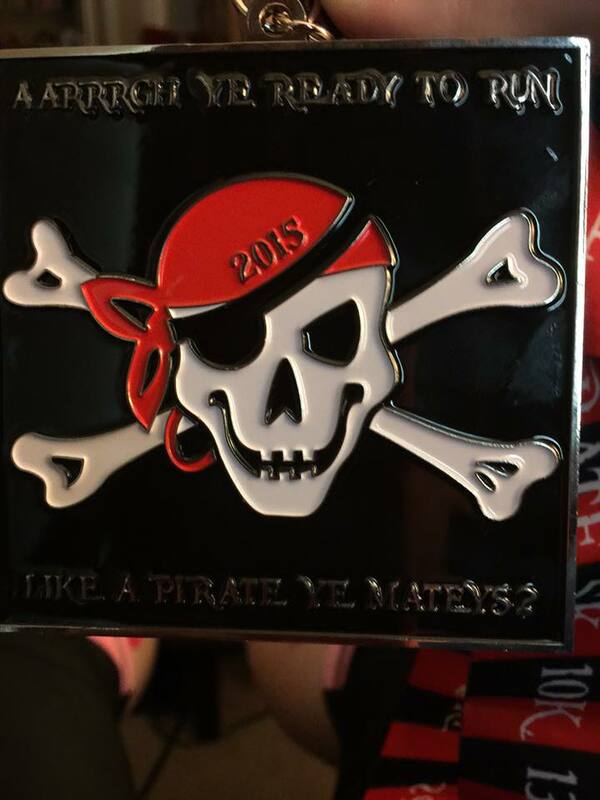 Despite not having trained the way I should have done before attempting this feat, I decided to go ahead and do the 10K and the half marathon. It was totally a mental thing for me. With some of the nagging little injuries I kept having, I knew doing these races at my size was iffy. I had several challenges coming up requiring me to do a 10K followed by a half marathon the next day. I needed to believe in myself, and I needed to know I could do it. First, the 10K. I woke up early, and I got ready. 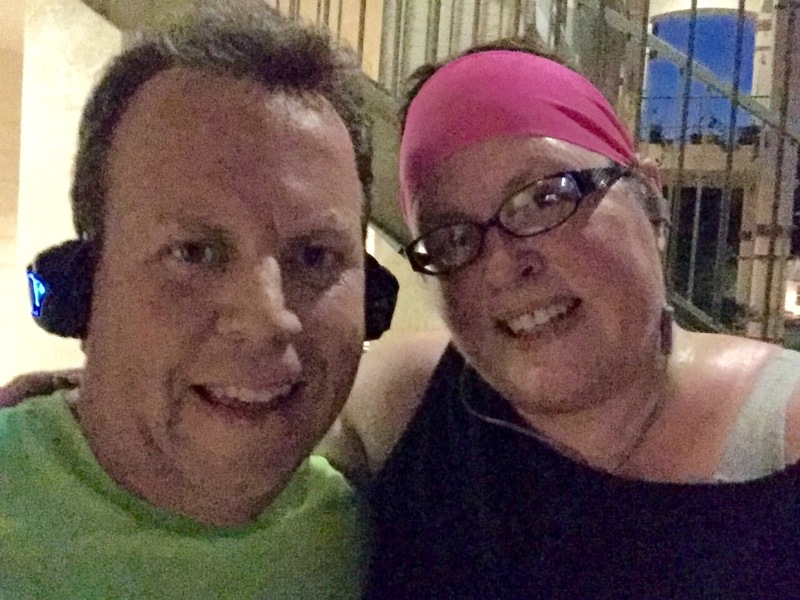 I was not particularly stressed out about the race, because my husband was going to be doing the race with me, and in training, I had gone that distance before, and felt pretty good. We got ready, I ate a breakfast bagel sandwich, and off we went. My friend Brandon and his girlfriend Shaleka were also there with us for this race, so we walked to the starting area. The walk was about a mile from the hotel, and I definitely was of the mindset I wanted all this walking to come off the total distance I was going to have to do that day. Either way, we arrived early, and we hung around waiting for the start. Brandon and Shaleka went off on their own, and Michael and I went on our way. We agreed from the start that we were going to be taking it easy, as I really had no idea what to expect the next day at the half marathon. I tried to do a couple of running intervals, and the hip injury reared its ugly head and I backed right off. We decided to just walk at a quick pace, and cover the miles. I do not remember specifics from the race, other than the fact that I felt pretty decent. I was feeling strong and powerful, and I enjoyed it for the most part. After the finish, I was feeling it. I felt like I had a couple of (managable) blisters, and my muscles were sore, sore, sore. I was stiff, and overall, right after the race, I was worried about the next day. I definitely was ready to go back to the hotel. I took a couple of epsom salt soak baths, and I had this amazing husband of mine who rubbed my feet and calves, and I just decided I wasn’t going to decide until the next morning what I was going to do. I got plenty of rest, we ordered room service for dinner, and I slept. The next morning when my alarm went off, I got up and I tested the waters some. I walked around the room, and I had a little stiffness in my calves, and my feet hurt a little bit from the blisters, but overall, I felt pretty decent. I consulted with Michael, and he made it clear he supported me, and he believed I could do it. That was really all I needed to hear. The biggest mistake I made that day, however, is they couldn’t bring me my breakfast, so I said don’t worry about it. I didn’t eat a thing before going 13.1 miles. Really, really bad idea. At the start line, I got to shake hands and a runner I had befriended while waiting for the start snapped this photo of me with Meb. I was really, really pumped! I met MEB! My husband also cheered me on right after the start, and I was off. I did a couple of run intervals, but then I started feeling that twinge in my hip again, so I resigned myself to walking. In the back of my mind was always the timing. I wanted/needed to be an official finisher in order to qualify for the Texas Legend medal after the Dallas Rock n’ Roll half in March. The timing was fairly generous, I just had to finish in 4 hours. I felt that would not be difficult, and the first 6 miles, I was feeling pretty awesome. I was actually keeping a good pace, and then we wound around to the San Antonio Zoo and I encountered my first HILL. Holy cow. I will not post all of the cursing I did when I saw that hill, because I was just not prepared. 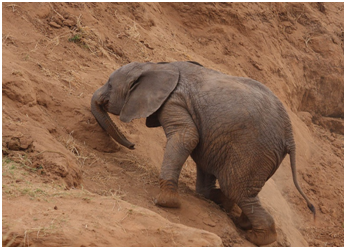 I made it up that hill, then we went downhill, then back up another hill. All I could think was, TEXAS IS SUPPOSED TO BE FLAT! I remember a medical worker saying to me at the top of the second hill that it was all downhill or flat from there (around mile 8) and I remember thinking, if he is lying to me, I swear, I am coming back to find him after the race. Luckily for me, it was. Around mile 10, I started really feeling it. I knew I was going to finish, I had come too far not to finish, but I was so miserable. I looked at all the side roads and mentally thought about telling my husband to come pick me up at that intersection, or the next one, and so on. I just kept putting one foot in front of the other, and looking behind me. 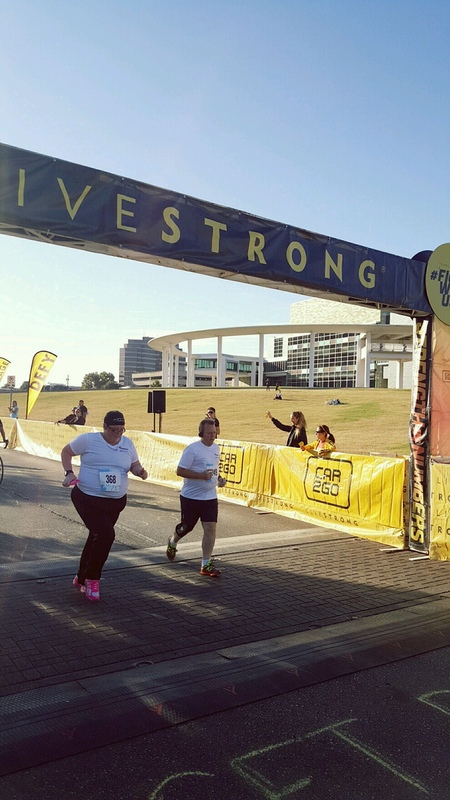 My two goals were to be an official finisher, and not to finish last, and I was doing okay. The worst mile of my life thus far was mile 13. That 1.1 mile from mile 12 to the finish line was horrific. I felt like it went on forever, and I was suffering. I was continuing on sheer will power at this point. I felt nauseous, my feet were killing me, and all I could think was, I have to do this. 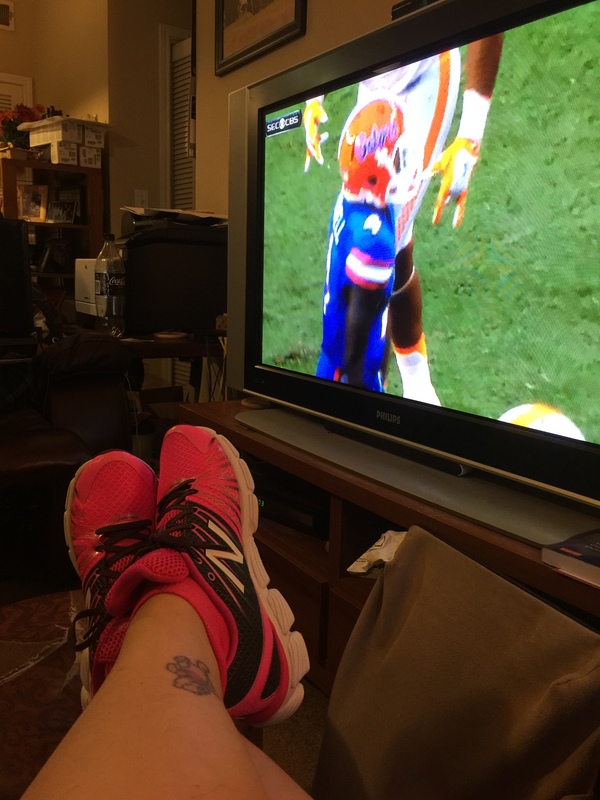 Near the finish line, my husband was there and I saw his smiling, happy, cheering face and I just shook my head at him and put my hand up, because I in no way wanted to celebrate a damned thing, and I had to concentrate, one foot in front of the other. He snapped this shot as I was getting ready to cross the finish line, and phew, I was done. I actually had a lot of problems immediately following the race. I thought I was going to pass out, and I was very nauseated. I never should have done that race without something in my stomach. My feet were killing me, and I just could not go any further. The idea of having to walk over a mile back to our hotel was abhorrent to me and when I was able to get a grip, my husband got the car and came to pick me up. 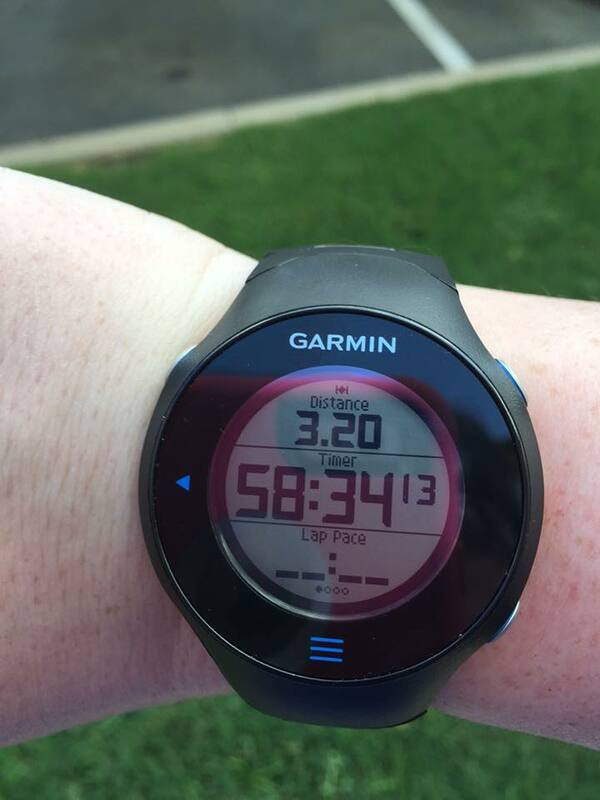 Despite being horribly sore and having ridiculous blisters, I did it! As you can see, I was still able to smile and pose with my medals, once we made it back to the room. A few days later, when we made it back home to Austin, I got the tattoo I swore I was going to get in honor of my first 19.3 mile challenge. I have been remiss in documenting my running journey as of late, and since my primary purpose of this blog is to keep track of how I am feeling and how I am progressing, I am sorry for that fact. I remember a time in my life, not too far in the past, where I spent a great deal of time at home on my laptop computer. I have not been using it as much, more relying on my iPad and my iPhone, which makes it difficult to write a proper blog post with photos. I will do better, because I think this is an important part of my journey. 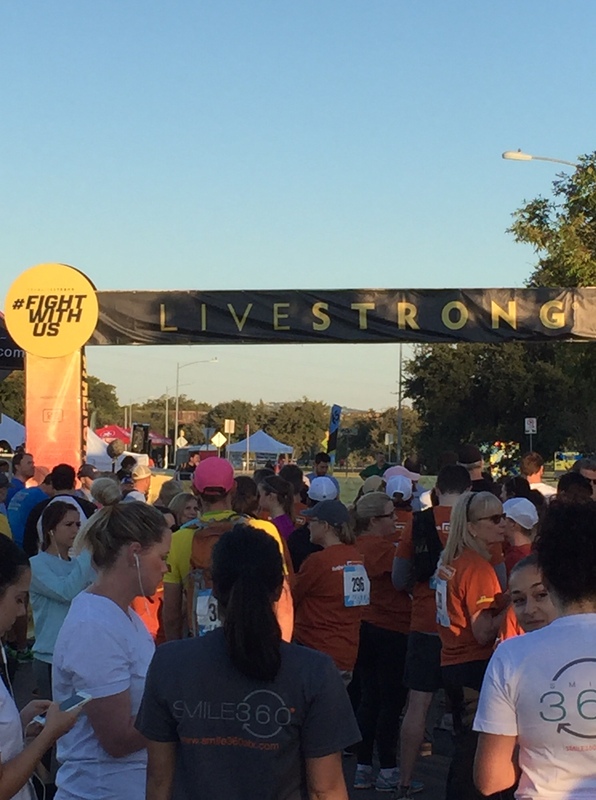 As you can see in the above photo, we ran the LIVESTRONG 5K on Sunday, October 18th. It was a relatively small race that started after the REAL event, the bike races, were on their way. I was participating along with several coworkers, as well as with my faithful, trusty husband. It really was a gorgeous day, and I was feeling pretty good going into the race. As we started running, I went to take my Garmin watch out of sleep mode and became very frustrated. Despite it being a gorgeous, cloud-free day, it took forever to find the satellites and this really messed up my plan for perfect 30 second running/90 second walking intervals. On the other hand, I ran for probably the first 3-4 tenths of a mile simply while I was waiting for the watch to kick in. By the time it did, I had already given up on any hope of doing precise intervals and just started running when I felt like it and walking when I felt like it. As usual, my husband simply kept pace with me. I felt like I was really walking much faster than usual despite not running as frequently as I wanted, and my husband confirmed this. I attribute some of that to the playlist I created that had some powerful songs about breast cancer. I am really seeing a pattern with my runs, whether it is a race or training. I do NOT enjoy running very much in the middle. I am thinking about how much I wish I could just go sit down and quit, I am thinking it is taking forever, and I am contemplating how important running REALLY is to me. Also in the pattern is how Amazing I feel when I finish the race. I feel so good, so accomplished, and ridiculously proud of myself, and I want to go do more! Something else that has been a pattern is…I beat my last time! I have run my 5K distance faster and faster every time. 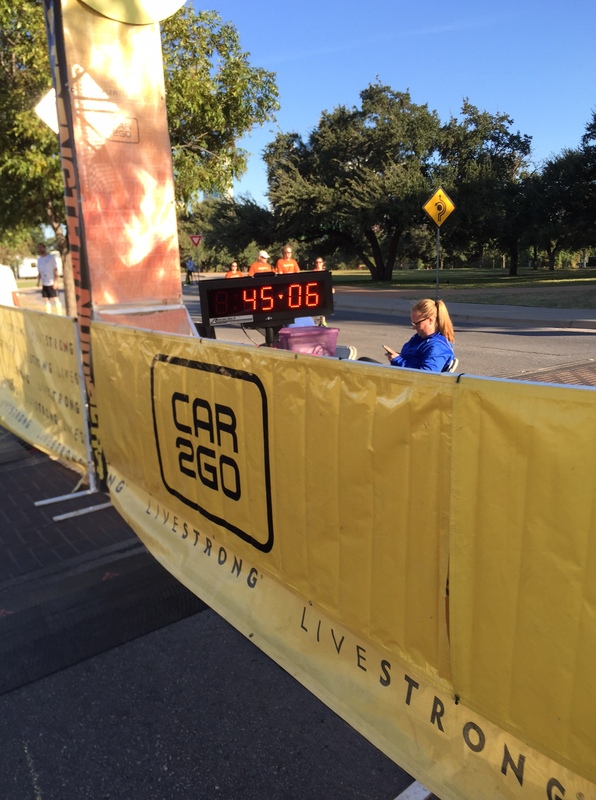 At this race, I finished in just over 45 minutes, which completely shocked me. 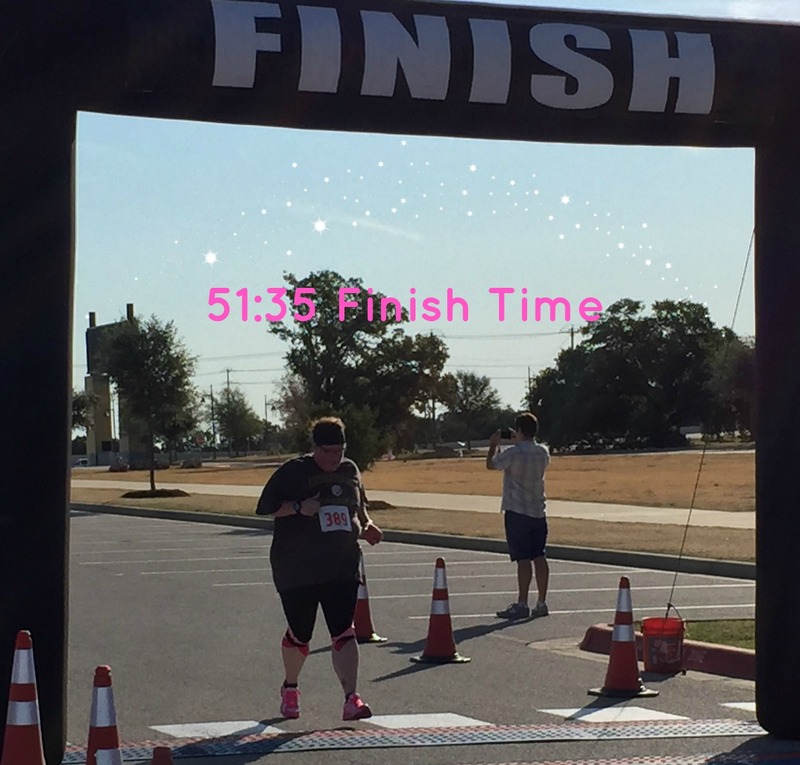 I had a list of goals, and one of those goals was to finish a 5K in less than 45 minutes. That might not seem like a huge goal for some, but I finished my first 5K in like 57 minutes back in August, so I thought it was a reasonable goal. I nearly beat that goal at this race, and I was totally excited! I am obviously getting faster, and the idea that I am at a 15 minute mile is awesome, because it really lets me know I should be able to stay ahead of the balloon ladies at Disney World, as long as I train properly. After the race, we sat down on the curb and rested a bit. My husband’s foot was bothering him, and the rest of my coworkers went to enjoy the free breakfast being offered, but I have found I am really not hungry after a race. 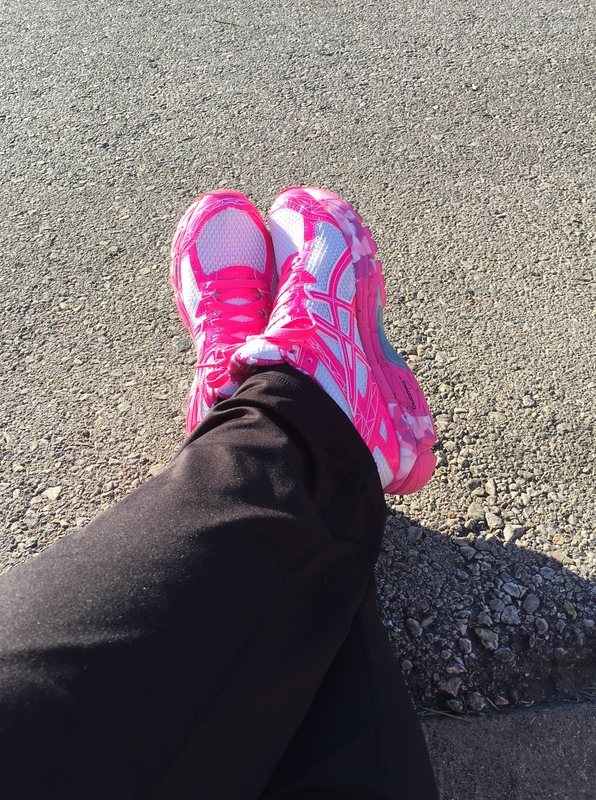 Perhaps that will change as my distances increase, but I was content to recover while looking at my pretty pink ASICS. Looking forward, this weekend, we are going to Houston and running in the Susan B. Komen 5K. 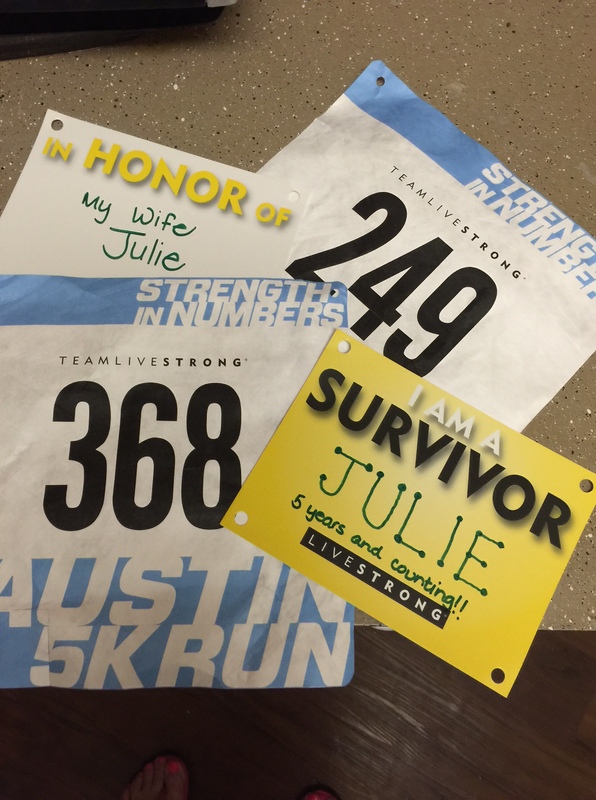 I received my race packet, and I was surprised to see I had two race shirts, one that everyone will get, and one that is just for survivors. I am sure this is going to be a very emotional race for me, and I am hoping I will be able to beat the 45 minute mark. 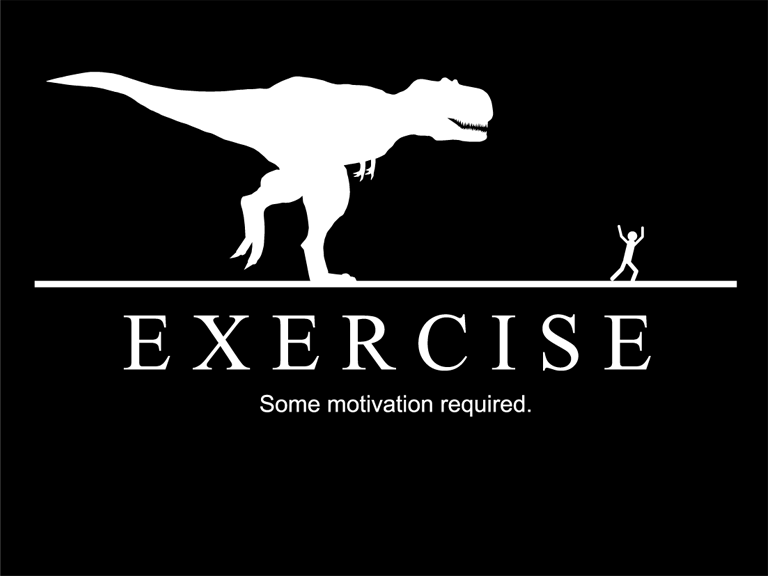 If I do meet that goal, the next goal will be to run a 5K in less than 30 minutes. I am sure I won’t reach that goal as quickly, but I think a little less than a 10 minute mile seems like a reasonable speed goal for me. I never plan to be super speedy, this is not about seeing how fast I can go. This is, and always has been about developing a better level of fitness, and endurance. I want to be able to run longer distances, and as I have mentioned in other posts and I continue to realize, that really makes it a mental battle. I pride myself on being mentally hardy, so I am going to make this happen. 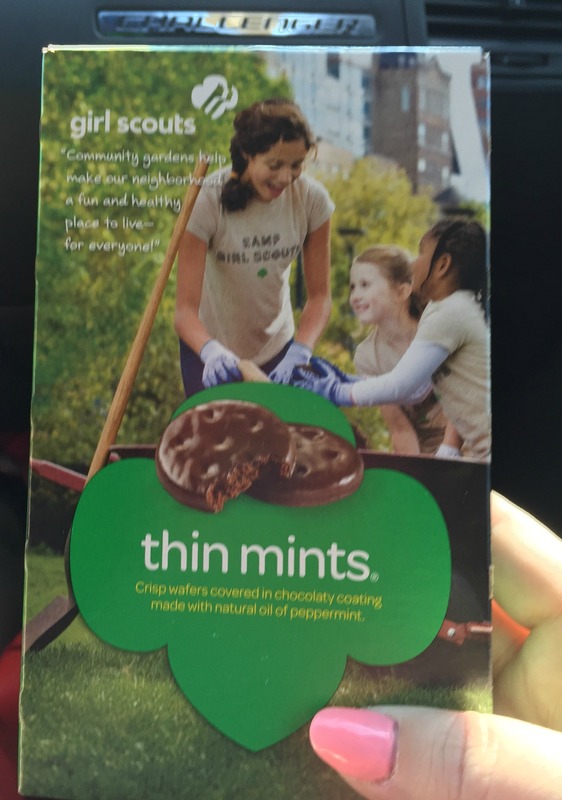 Yesterday, I participated in a 5K sponsored by Girl Scouts called the Thin Mint Sprint. 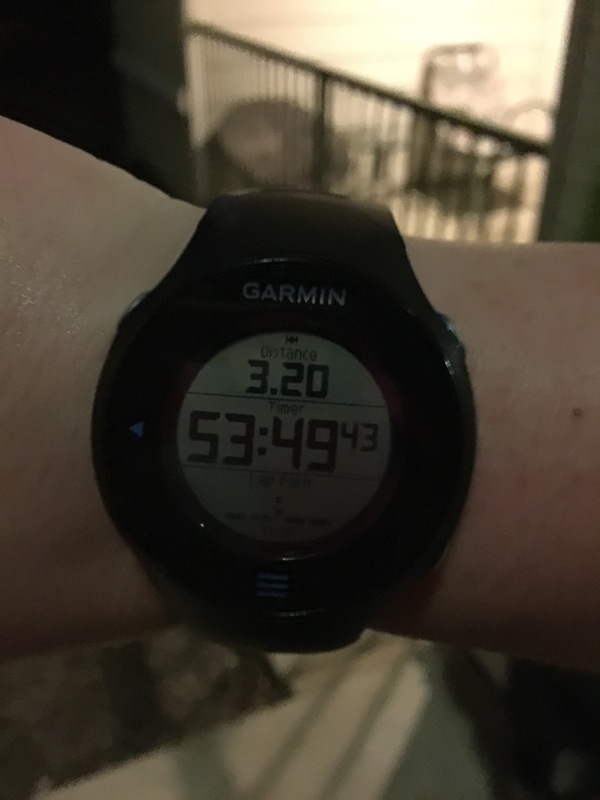 Originally, I was going to run the 10K in order to submit a time to help my corral placement at the Disney Princess Half Marathon, however, I realized I was in no way ready to run that race fast enough to actually make an improvement in my starting corral, so I switched down to the 5K. It really was a beautiful day, the sun was shining but it was only in the 60’s. I was feeling pretty motivated to do a decent job. I was a little concerned, because this week I haven’t been able to run because last week, I injured my right second toe. There was a blood blister beneath the toenail, and then the entire toe was a little bruised. Being a diabetic, I worry about my feet, so I just wanted to make sure it didn’t get worse, or get infected. I took it easy this week though, and my toe didn’t look any worse, so off I went to run the race! I started off feeling pretty strong. I planned to do my 30:90 run/walk intervals, as I had been successful with that last week in my training run, taking off several minutes from my time. I realized, however, that I was going too fast during my first mile. I was really feeling it. One of the things I realized was that having my husband with me is how I keep on a steady pace. If you look at my training runs, my splits are pretty even. I was at 15:02 at mile one and I knew this didn’t really bode well for me, since my average mile time is about 17:30. I got pretty discouraged at that point, and I thought about quitting. The only thing that kept me from quitting was probably that I had to get back to the starting area in order to leave, so, I might as well finish! I have had that problem on some runs, where I am just really questioning what the heck I am doing. 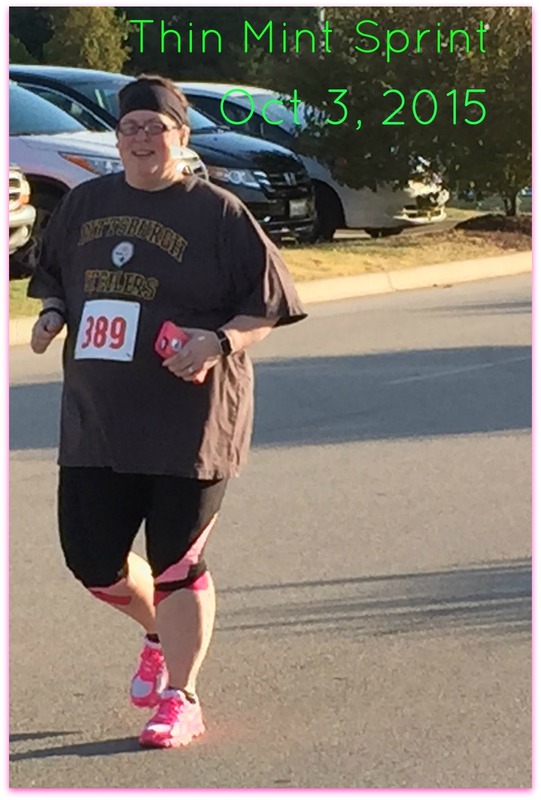 Because I am overweight, running makes things jiggle and it is not always pleasant. I know I am improving, I know it will get better, but in the actual moment, I sometimes have a hard time going forward. I did finish, and I shaved another two minutes off my time. I didn’t feel horrible physically, and mentally, of course, I was proud of myself. I was not able to stick with my 30:90 intervals, so I was pretty surprised I shaved time off my best, but I will take it. One good thing to come out of this is my husband also realized how important he is to my process, at least right now. He has stepped up to the plate and he has agreed to run all my races with me until the Disney Princess Half. Considering the issues he has with his knees, it really shows me how much he loves me. 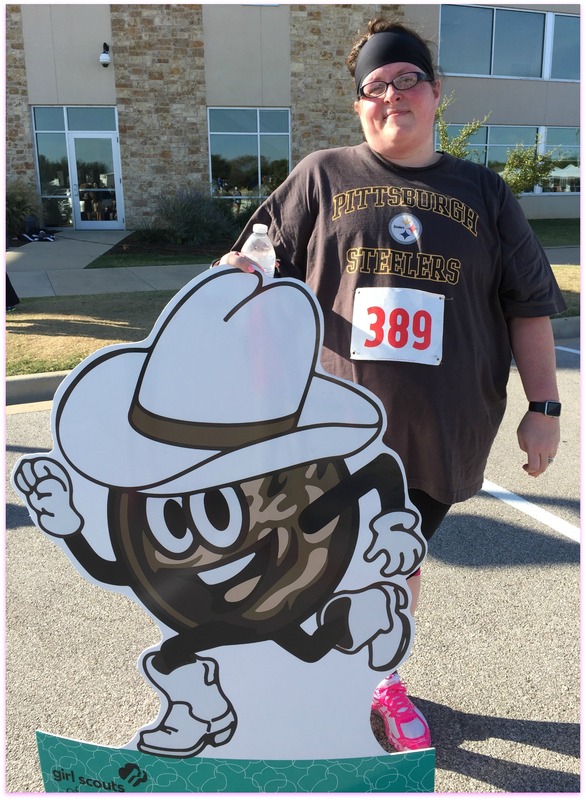 When we first got to the race site, I was grumbling to my husband that if I was getting up early in the morning to run a race by Girl Scouts called the Thin Mint Sprint, I should be getting some Girl Scout cookies. I mentioned it several times actually, from when I registered, up until race day. When I checked in and got my race bib and packet, guess what I got?!? Yep! Will run for cookies! ***I should point out even though I was so excited to get the cookies, I gave them to my son when I got home, because I didn’t want to negate all the efforts I have been putting in, but next year I am running this race and I am keeping my Thin Mints!